Creativity is the use of ideas, imagination and intuition to make or create something. It is a process that involves clarity, invention, originality, decision-making, deep listening, attention to detail, trust, empathy, vision, good instincts, and, the ability to communicate engagingly with others – sometimes all at once! But how do you achieve this in today’s super-busy, distraction-filled, ‘time-poor’ climate? Often it’s a struggle to find a moment to ‘reach inside’ and find the stories you want to tell, the ideas you want to share, or even to produce the things you want to make. How do you make that space for a ‘light bulb moment’ or inspiration to happen? Meditation For Creativity is a seven-week course that will teach you the fundamentals of meditation* and how to apply them to your own creative process so you can more fully realise your potential and find those innovative ideas. Whether you’re an artist, writer, performer, storyteller, crafter, musician, innovator, in business – or someone who just values the importance of living and thinking creatively – this course is for you! From September 26 – November 7, 2015, seven x 90-minute classes will be held weekly on Saturday mornings at Körper Raum Mitte (Berlin) in English language. Places are strictly limited! Course enrolments close by 5pm, Wednesday September 23 and must be secured with a 50% deposit payment by that date. 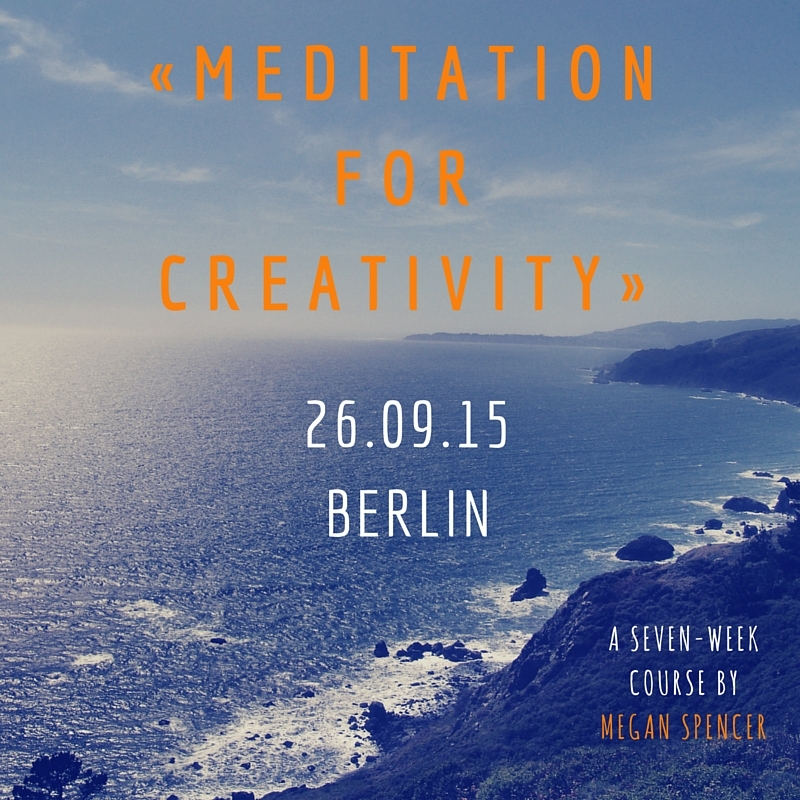 * A Mindfulness Based Stillness Meditation approach will be used in this course. When: Saturdays, 10:30-12:00 | Saturday September 26 – Saturday November 7, 2015 | Please note that this is a 7-week, sequential course, and single classes are not available in this instance. Bookings: hello@themeganspencer.com | In order to secure your place, a 50% deposit (€52.50) must be paid by 5pm Wednesday September 23, 2015. I will email you the payment options once you have contacted me to reserve your place. How: The meditation class will be conducted mostly seated on chairs. About The Teacher: Megan Spencer is a highly experienced media-arts professional, and a meditation practitioner from Australia, who now lives in Berlin. She has an Masters in Media Arts from RMIT University and a dynamic history as a radio maker/broadcaster, filmmaker, writer, critic and photographer – and as public speaker, teacher and workshop facilitator. In July 2015 she co-presented the two-day Deep Storytelling: Creating A Culture Of Connection workshop at Impact Hub Berlin. She has studied and practiced meditation since 2009, first learning it at The Gawler Foundation Yarra Valley Living Centre in Victoria, Australia, where she also completed a Meditation Teacher Training course in 2011. She has further studied meditation and Buddhism at the Atisha Buddhist Centre in Central Victoria, Australia, with teachers Ven. Robina Courtin, Ven. Thubten Gyatso and Ven. Thubten Lhundrup.